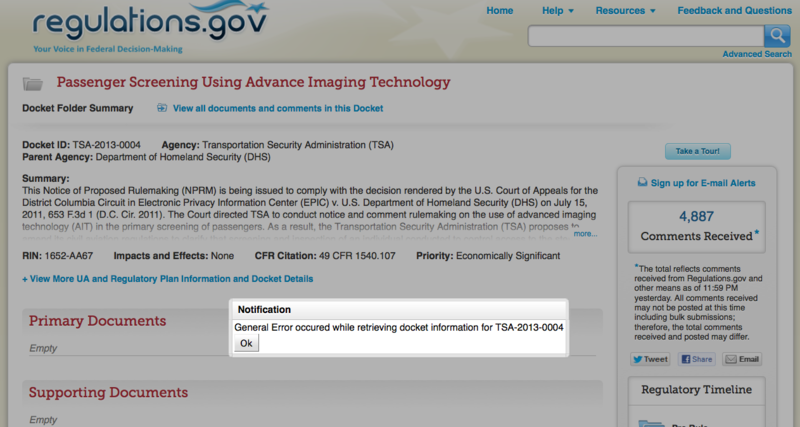 If you’re tired of the TSA to electronically strip-searching us, abusing and humiliating people, making kids cry, and wasting billions of dollars on technology that doesn’t actually make us more secure, make sure to file your comments by Monday June 24 at 11:59 p.m. You can theoretically submit comments online via regulations.gov (although as I write this the site isn’t working), or by FAX or mail. See the first reply to this post for more about how to file comments. The most effective comments include personal experiences, and be specific about what you want to happen and why. EPIC recommends that commenters support “Regulatory Alternative #3″ (the use of walk through metal detectors and explosive trace detection devices) and support the right of passengers to opt out. tsacomments.net has a lot more information about the various issues. You can see my comment below; feel free to use any of the language. The number of comments sent in to the TSA matter. If the TSA doesn’t get a lot of comments, they’ll say it shows that most people don’t have any problem with the body scanners or TSA’s other security procedures. But if there’s a much more vocal response, it’s much harder for the TSA to ignore them – they’re required by law to reply to all the issues that are brought up in the commenting period. So please, send in your comments! The proposed rule is vaguely written and should be withdrawn, and the practices it would authorizes should be suspended. TSA should conduct a new cost-benefit analysis that fully considers the impact of body scanners and pat-downs on traveler privacy. If the rule is not withdrawn, it should be modified to adopt Regulatory Alternative #3 (walk-through metal detectors as primary screening and explosives trace detection on a random set of passengers) instead of AIT and pat-downs. To the extent TSA continues the use of body scanners and pat-downs, the final rule should codify minimum protections, including guaranteeing individual passenger image data is not retained; that all physical searches are conducted by officers of the same self-identified gender; that secondary screening will be conducted in private at passenger’s election; that searches to resolve an anomaly are no more intrusive then necessary to resolve the anomaly; that screeners receive training on working with diverse populations; and that no traveler will be subject to discrimination on the basis of religion or gender identity. Posted by jon on Saturday, June 22nd, 2013, at 11:25 am, and filed under Uncategorized.